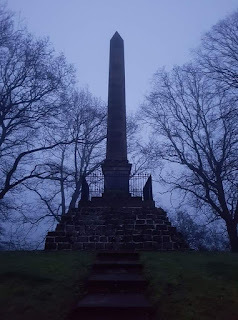 So, mid-March last year I found myself on Naseby battlefield at 6 o'clock in the morning. Which is pretty impressive considering it is a two and a bit hour drive from home. Why on earth was I there at that time of day? #1 son had gone on a day trip (!) to Auschwitz and had needed to be at East Midlands airport at silly o'clock in the morning. In my wisdom I decided that it wasn't really worth driving home, only to have to drive back to pick him (and the rest of the contingent from his sixth form) up. So amongst other things I decided to have a detour to visit the battlefield. As it was foggy and dark at that time I stopped for a brief coffee, before heading off to Rutland Water for a meeting. Returning to the battlefield in late afternoon, by which time it was basking under blue skies. The battlefield is very well preserved, with few buildings built on top of it. Unfortunately there are few rights of way across the fields but there are a number of staged vantage points with interpretive panels. The Fairfax and Prince Rupert viewpoints have a number of flags and standards flying which are useful in getting your bearings. Download pages for offline viewing before you visit as data coverage is pretty sporadic in the area. The Naseby Battlefield Trust are trying to build a visitor centre, adjacent to the parish church, which would be a fitting way to commemorate such a pivotal event in the constitutional development of our nation. Battlefields Trust has a number of downloads for Naseby including the relevant OS map of the site. As I drove around the site I found it quite difficult to find some of the viewpoints using the NBT interactive map and my car satnav (at the time I didn't have any postcodes other than the obelisk). The obelisk was easy to find, as was the Fairfax viewpoint. Next I found the Cromwell memorial, the ROC took some finding and I had given up on visiting Rupert's viewpoint when I suddenly drove past it. A word of caution - the car park at Rupert's looks like it gets busy for reasons other than visiting Rupert's view. Seeing as it is in the middle of nowhere I will leave that to your imagination. Update: I have since found this map from NBT which gives directions to each viewpoint. Strange that it isn't easily accessible from their homepage. I missed the other viewpoints, with hindsight the OS map from the Battlefields Trust in combination with the NBT detailed map (linked to above) would have been more helpful. A return visit is definitely in order. Having said that even from my brief visit it was possible to get a good feel for the terrain, and the size of the battle itself.